One of my favorite species as bonsai would have to be the Juniper. No bonsai collection is complete without at least one of these beautiful trees. 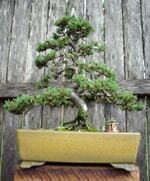 Most species of Juniper naturally lend themselves well to most styles of Japanese bonsai. With compact growth, fine foliage and branches that can usually be bent and twisted easily, they are a great choice especially for the beginner. Care needs to be taken when wiring not to damage soft bark by too much twisting, and needles can be prickly so gloves may be needed when handling. Pinch back foliage with a twisting motion between thumb and fingers, rather than pruning with scissors to avoid browning of the foliage. Thin out foliage during spring to avoid pests having somewhere to hide and to increase air flow to avoid fungal infection. Junipers seem to thrive in most conditions. They will handle full sun as long as the water is kept up to them and they will handle shade if you are careful not to over water and avoid wet foliage. 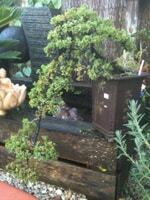 The maintenance of juniper bonsai is relatively easy. Pinching out of vigorous growing tips during spring and summer will help keep the foliage pads compact. Caterpillars, Fungus and scale insects seem to be the worst of the junipers problems. Being vigilant and checking for signs of the needles being stuck together usually near the tips where the growth is fresh, will usually spot caterpillars settling in before they become a problem. Avoid wetting foliage of a night time especially during winter and keeping foliage pads thinned out to allow for air flow helps avoid any fungus growth. have caused major damage to your tree by the time you discover them because your juniper looks unwell. Most pests on the juniper can be controlled with a spray of white oil or pyrethrum. Using a systemic insecticide for scale may be necessary if the infestation gets out of control, Maldison is the best I have found to date. Spraying junipers monthly during winter with lime sulphur can help to control both fungal infection and pests in hiding. 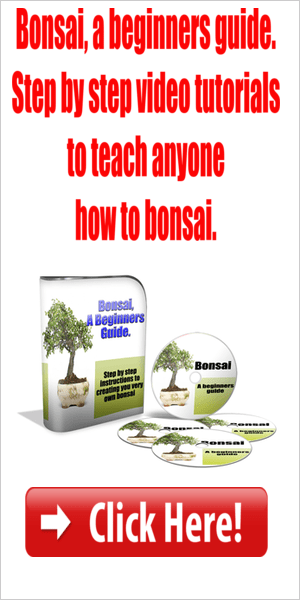 Return to bonsai tree care!